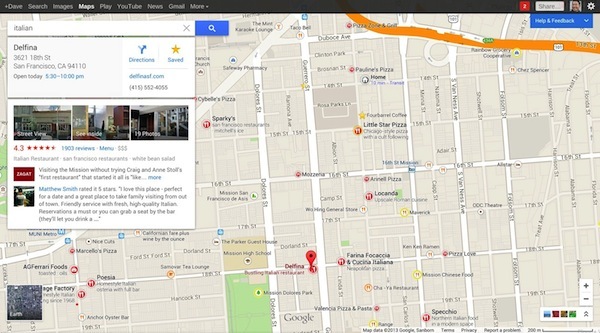 Google has announced a revamping of Google Maps and it is much more than a few changes. It is a reworking of the entire Google Maps interface from the group up, designed to make Maps more intuitive for users. One major change is users can now click on any area of a map, and Google will respond by showing you information about what is in the area that you could be interested in, such as restaurants, businesses, and hotels. This is designed to make it easy for visitors to see what is near a particular location, such as discovering what is located near a hotel when someone is visiting a city. There is much more connection with Google+ and what they display on the map popups, meaning it is much more critical for businesses to make sure their Google+ page is active with correct information, including hours and photos, and user reviews of their business. What businesses are displayed are also influenced by each user’s Google+ network, highlighting specific businesses that Google+ connection have given positive reviews for. So that also makes it well worth it for businesses to promote their Google+ pages to engage users for more reviews, increasing the likelihood that their business shows up first for more people. Google Maps search results are much more clearly added to the maps page. For example, they included a screenshot highlighting a user searching for an Italian restaurant, it not only displays the first result as an overlay on the map, it also shows all related Italian restaurants in the area with restaurant names and short blurbs about each one. They have also redesigned how advertisements are placed on Google Maps. Formerly, different colored pins on the map represented paid advertising versus non-paid, however, engagement wasn’t that high as many users didn’t understand what the different colors meant. Now, short snippets of ads are placed directly onto the map itself with the business name, alerting users to an advertisement or special deal for that business. The new style of ads are in the testing phase and advertisers aren’t being charged for ad clicks at this time. However, this ad style is for desktop only, not mobile. The new version of Google Maps is by invite only. You can request an invite here. On a related note, Google announced that Maps users will now be able to rate businesses on a scale of one to five stars, as opposed to the Zagat 30-point scale. Though Google noted Zagat reviews will still be available throughout Google.